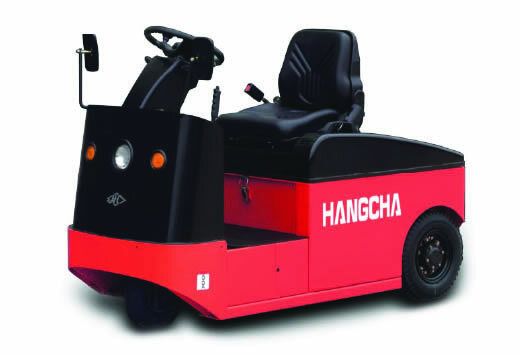 The Hangcha Electric Tow Tractor J Series 2.0 – 6.0t offers towing capacity from 2-6 tones and is ideal for transporting people and goods in manufacturing plants, airports, and hospitals. The rugged design offers optimum performance in even the toughest applications and the Hydraulic heavy-duty disc brakes help reduce brake wear. The driver operator position includes a large footwell enabling easy entry and exit from the vehicle, resulting in a safe and ergonomic operation. What’s more, the truck provides easy access to battery and components which results in a quick battery change whenever required. The 3-phase AC motors offers higher performance while simultaneously reducing operating costs. Benefit from powerful acceleration and high top speed, even when laden and a rapid change in direction of travel.